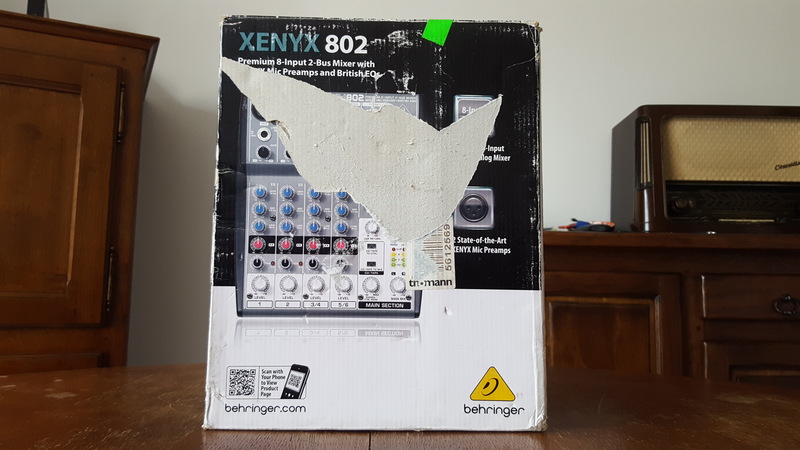 Xenyx 802, Analog Mixer from Behringer in the Xenyx series. -1.9" X 7.4" X 8.7"
sacchetta's review"Bought it just incase, ended up using it all the time!" The Behringer XENYX 802 is a great portable unit for that engineer on the go. I personally use it for headphone mixes almost every time I'm at the studio. I've even seen people use it with their TV, surround sound and game systems! This small analogue mixer is well worth the MSRP of $100. The unit is not rackable but it will easily fit on any flat surface. At about 9"X7" the Behringer XENYX 802 will save you lots of valuable desktop space. The unit is analogue only, this means no digital out's or built in effects. The 802 has XLR, TRS/TS & RCA connection jacks. This mixer isn't trying to play tricks on you, it's really easy to use. Every thing is labelled very clearly and it shouldn't confuse even the beginner (okay well maybe not the absolute beginner, if you are going to be a pain about it). Although it doesn't have sliding faders, the knob faders are easy enough to understand. No USB = no install problems. You never know which system update will cause your interface to stop working. This unit won't have to go through those types of problems due to its analogue genetics. There's something humbling about using a piece of analogue gear, maybe its because it won't crash on you. Keep in mind this mixer isn't going to give sound to your computer (unless you have the cables and an input on your computer). The manual is alright. 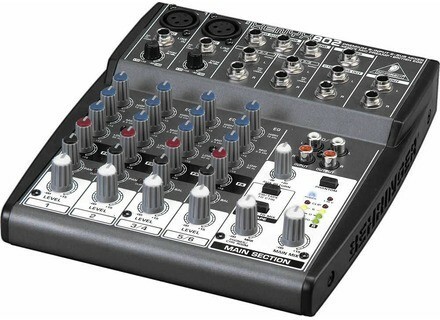 You can't blame Behringer for wanting to put a few different models together in one manual. It saves space, money and time. However it can be confusing to the beginner so be sure to always check which models features you are actually looking at. There is also a CD/Tape to CTRL button and a CD/Tape to mix button. They come in handy when you want to mix in an external line level signal such as an iPod, CD player, etc. There is no audible hiss or noise (unless blasting the gain knob and fader). The XENYX 802 has smooth gain that leaves you with enough headroom incase your singer decides to wail out their final lines. The mic inputs on the unit has a +10dB - +60dB range in the gain stage. The line inputs preform almost as hot, getting a -10dB - +40dB range in the gain stage. I really like the dual XLR/TRS connectors for channels 1&2. You get the freedom of being able to connect something like a guitar or a keyboard into your primary channels. In case you've gone a little overboard with the gain you'll be happy that there is a handy red "clip" LED. And yes, I know you are an audio expert and can hear when there is any clipping, however some of us just enjoy the ease of seeing the LED go into "code red". The 802 features 3 british EQs which compliment every channel. Lets keep in mind that you don't have an adjustable frequency knob (it would send the price of the unit up), what you do have is a low EQ of 80Hz, a mid of 2.5kHz and a high of 12kHz. You are getting -/+15dB per EQ, which I've found to be especially effective for eliminating headphone bleed when recording and using the 802 for a hearback unit. A nice added bonus is that the 802 has blue coloured EQ knobs. Not the biggest deal but it is kind of a disappointment when you get a unit without colour coded knobs (you want to be able to quickly glance at your board if changes need to be made). Say the built in EQ isn't enough for you, good thing you've got your aux out and stereo return. Send signal from each of your channels to an external EQ (or reverb, or delay, etc). Return your beautifully EQ'd signal in stereo, then watch how easy it fits into your mix. It should be noted that the aux knob has a range of infinity to +20dB. Now if you are using this as a headphone mixer for a musician like I am I'll have to warn you, this unit's headphone mix doesn't come out super hot. I've been close to being maxed out before some clients are satisfied with their levels but then again with some nice over the ear headphones they should be fine. As for over all sound of the unit, it does sound nice and the price makes it sound even better. The british EQs indeed sound like they've come straight off of a big british console, but like I said, it would be nice to have some frequency control. The gain sound is surprising, you would think that a $80 mixer is not going to be good for in the studio, just at home. This isn't true, I don't have a real reason to use it in studio, but I have and 98% of people aren't going to be able to tell any difference between this mixer and a full desk mixer. What I most liked about the XENYX was the size. The unit only measures 1.9" X 7.4" X 8.7", this is about the size a small mousepad and it takes up next to no surface area, leaving your desktop free for all kinds of other junk (please put the caps back on your water bottles, for all of our sakes). What I like least about the 802 was that it has plastic sides. I'm not the type to drop my gear, but if it happens I would feel more secure if the sides were also some sort of metal. What a value for the price. I've been seeing them for about $80 average and you can't really complain. Even if its just a mixer for your small TV system, the price of the 802 makes its irresistible. Lets remember that this unit has been around for years now so there are probably better choices for better prices. This unit has gone down in price a bit since it's release, but that is to be expected. The sound of this unit was medium-high quality and the precision was just about the same. You can be assured that you are getting what you pay for plus even more! A rule of thumb for mixers is price per channel and if I were to average it all out I'd say you are looking at about $100 per channel for quality pre amps. If that doesn't convince you of it's value I don't know what will. I didn't try other models when looking at the 802. I had already owned a XENYX 1622 so I knew what to expect. It's nice to have the 1622's little brother around. Like I have said many times before, it's nice to have a small portable unit just incase. Knowing what I know now, yes I would absolutely make the same choice. In fact if anyone wants to send me one, I'll take a second! It would be a nice everyday carry mixer (yes I have all the paperwork to legally carry a concealed mixer in my province). 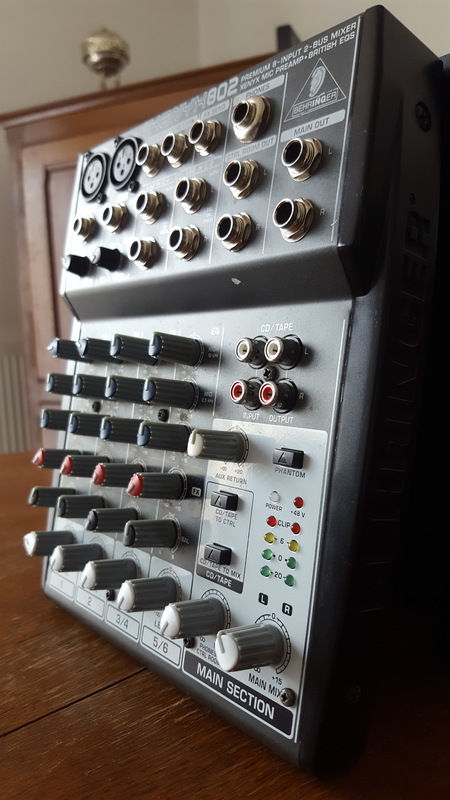 JimboSpins's review"Nice for small at home projects"
The Behringer XENYX 802 is an 8 channel mixer that is pretty standard. I have had about 3 of these in the last 5 years. It has been around for a while and Behringer is still selling it for about the same price that it came out for. It is very light and portable and can come anywhere with you. The knobs do break off easily though and the unit as a whole can get worn down quickly if you use it a lot. That is how I went through 3 of them over the last 5 years. These are great for small at home style projects or for karaoke or something similar to that. It does have a preamp with phantom power but it is not very good. It is pretty basic and will not give you the best quality of audio but you really cannot expect to get the best out of this unit because it is rather “cheap”. If you want to get better quality out of it for recording you will need to have a pretty good interface to make up for it. All of the basic functions are easy to use, the manual is clear and sufficient if you even need to look at it. No it does not generate a hiss but it is not as quiet as I thought it was going to be. The EQ is pretty good for it too be at this price. I do recommend getting this if you cannot afford a better set up, but that main purpose for me to get it was just for fun and to do some small stuff at home. But for some reason it just would not hold up for me. The Knobs on it were always breaking off, but it was a good thing that this is so inexpensive and it was easy to just go replace the whole thing. 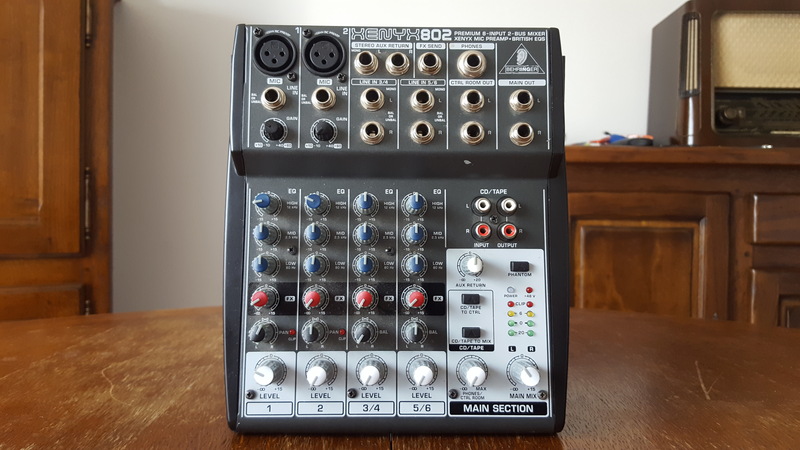 There are 8 channels on it and that is a huge plus for a 70 dollar mixer. It also has LED metering and some EQ options (3 bands on each channel). This mixer has all of the options needed to record with if it had better preamps I think it would be perfect. But for smaller at home stuff it does work great. I recently had a recording gig where power was limited, it was outdoors and all I needed was two tracks. Odd? Yes, but after some homework I settled on the Xenyz 802 mixer by Behringer. 2 reasons I went with it; Behringer is stocked just about every and has a great return policy to boot and also the price point can't be beat, it was $50. I have used it for a handful of small gigs including a DJ gig with powered speakers. It is small. It is smaller than the average laptop and well about spot on to the footprint of a Kindle. It is simple to use, plug n play with no real learning curve needed. It is a tad bit noisy and the preamps are so so. I know and expect this from a cheap mixer. If you are looking to do some worthwhile recordings though you may want to pass on it. Behringer makes a decent little mixer. It's been knocked around and dropped casually and still keeps on ticking. The knobs and jacks feel strong on it and I know Behringer has a great return policy. 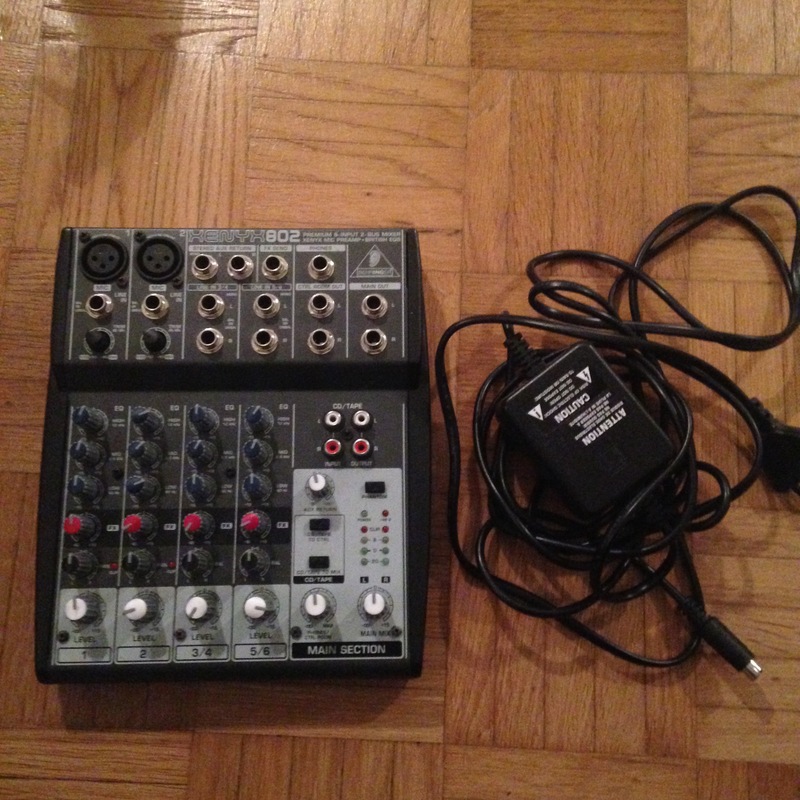 A nice little mixer for small projects and at a price you can easily pick it up to use as a backup or for DJ gigs. MGR/azmike1's review"Behringer 802 Xenyx Mixer \\ Vestax VDA 1000 Power Amp"
don't know. sent them back. The Behringer 802 Xenyx mixer and the Vestax VDA 1000 power amp were ordered by me Wed nite to ship UPS 1 day, so they'd arrive Fri, and be on the plane with me Sat to New Orleans, and Sun on a 7 day cruise, to play my gig. Thurs email from Musician's Friend said the Behringer 802 Xenyx was shipped overnight, as requested, and the Vestax VDA 1000 was shipped ground, to arrive the next Tuesday, after I'd already left on the cruise where I needed it. Musician's Friend made me buy another Vestax VDA 1000 and have it shipped overnight to the Ramada Inn in New Orleans, to arrive Sat where I'd be spending the nite. This required me to call my bank and change my home address to the Ramada Inn in New Orleans so the Musician's Friend verification process would work, which is always required by them before shipping. My email this morn included one from Musician's Friend, saying this second purchased Vestax VDA 1000 amp was shipped ground also! They screwed me up twice! So my call this morn to Musician's Friend had me screaming for almost 2 minutes, being put on hold for 4 min, then told it was too late to help me, so they'd have to give me a refund, and file a Return to Sender on all 3 items. I didn't want a refund, I wanted the sound equipment! I told the floor manager at Musician's Friend they were only 40 minutes from the Kanas City airport, and they could get a Vestax VDA 1000 to me air frieght to the Ramada Inn in New Orleans. He told me Musician's Friend didn't do this, which to me is a strong indicator of the Musician's Friend true lack of concern for customer service. Now my bank will get my call to change my address back. What a pain! BTW, my ears have heard all great things about Behringer products. Also, the Vestax VDA 1000 in another web review apparently only puts out 100 watts, so the advertised numbers are not true.